"Advertising at the Edge of the Apocalypse is an extraordinary documentary, interesting visually and for the spoken text that includes references to science, social science studies, and political figures. It first focuses in on the development of sophisticated advertising as a way to deal with a major problem of economies that are based on, and motivated by, gaining ever greater profits. Capitalist countries produce enormous amounts of goods and must somehow convince people to buy them. Thus, the need in words of the early to mid century economist Joseph Schumpeter, to deploy “elaborate psychotechnics of advertising.” Advertising has become so pervasive in the media (including product placement in movies) and on the internet (Google and Facebook are mainly in the business of selling adds) that it has transformed our very culture. The consumerism that it encourages has helped to develop the ideology that what’s important is the individual and his/her consumption and not the well being of one’s community or the larger society. The film also explores the ecological damage being done by the massive production and consumption of more and more stuff, within a system that must grow and strive to produce more next year than this year. It gets to the heart of ecological and political problems facing humanity, outcomes of the very way the economic system works. 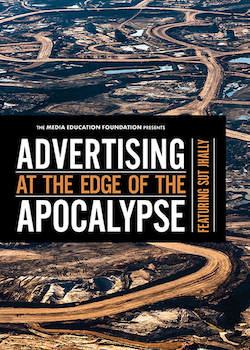 Advertising at the Edge of the Apocalypse also explores activism of people who are fighting against the consumerism and ecological destruction of capitalism. This is a film that should be seen by everyone concerned with environmental degradation and the social issues of inequality and poverty that plague the earth. It would be especially useful to be seen in group settings in which the critical issues raised can be discussed after viewing." "Anyone who watches Advertising at the Edge of the Apocalypse will come away with a clear (and alarming) perspective on how advertising has succeeded in occupying humans' minds, societies, and physical environments. Sut Jhally and his team have interwoven powerful images and empirical facts to show how consumer capitalism is crowding out healthy human values and killing the planet."